World in Motion: Keep Walking, Brazil. Johnnie Walker seems to always produce world class commercials. With an effort to boost Brazil from a sleeping giant to a colossus that has finally awakened, Johnnie Walker, and "Rock Giant," look to do just that. In the following commercial, you will see the "Rock Giant" emerge from Rio de Janeiro's scenic Sugar Loaf mountain and take his first few steps towards a new Brazil. A Brazil of the future. 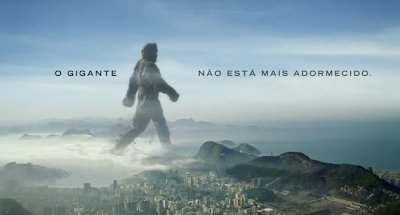 The commercial closes with the tag line, "The giant is no longer asleep" followed by the classic "Keep Walking" slogan tweaked to read "Keep Walking, Brazil." These types of commercials are the ones that are always so effective. The subtle ones. The ones that make you want to find it on YouTube and save it as a favorite so you can watch it again later on, even if you don't speak any Portuguese. Talk about effective.